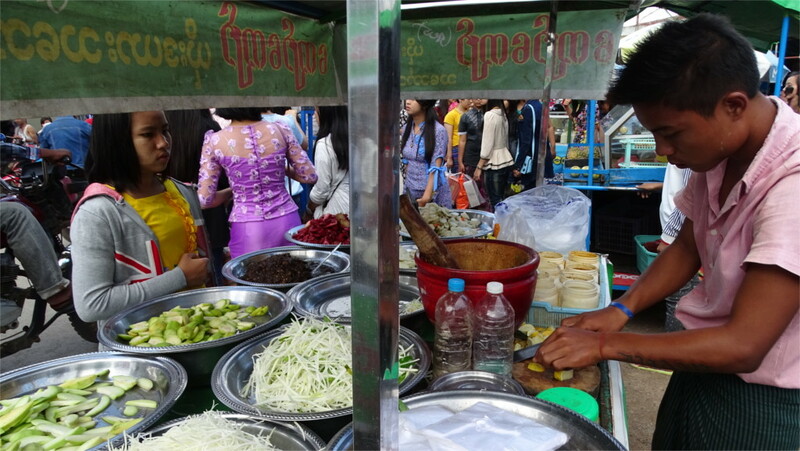 I began to discover street food in Myanmar today. The simplest are roasted corn on the cob and roasted sweet potatoes, like in the featured photo above. (Did you notice a funny thing about the stall: it has a mirror?) And the food gets more interesting from there. Ice cream is a great favourite: from the intensely coloured sorbets like the one you see in the photo here, to wonderfully creamy durian flavoured ice creams. On a Sunday it is easy to figure out what are particular favourites. In the middle of the day ice cream was the big draw. Tea shops are next in popularity. This is familiar enough to give me a handle on the rest of the food. 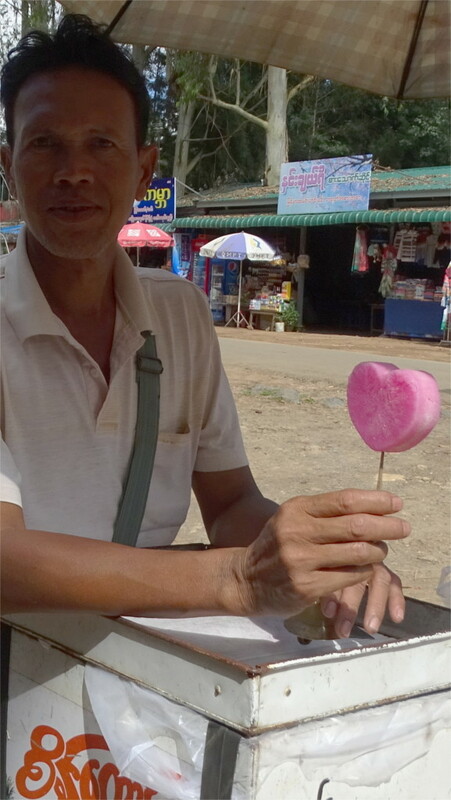 I discovered one more fact which explained what makes it possible for school children to have roadside snacks: there is a 50 kyat note. So all the blogs and travel sites which said that the lowest currency note is 100 kyat are wrong. A very popular snack later in the day was a spicy mixture of various things tossed together. You can see two kinds of guavas (the white discs with green skin), papaya cut into long strips, onions chopped into small pieces, tamarind (the dark matter) and a familiar tart tasting red fruit which I could not put a name to. All this was mixed with a secret sauce from the pot. This is very similar to many Indian snacks like bhel.